The Slate Digital PARALLEL LIFT: The Two Knob Mix Fixer! Slate Digital is known for modeling real-world hardware EQs—but in their Custom Series Bundle, they take the process a bit further, emulating different hardware EQs on a per-band basis. 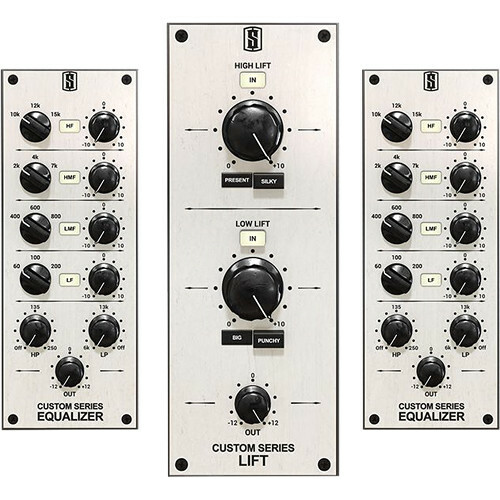 Two modules are provided in this downloadable software: the Custom Series EQ and the Custom Series Lift. These plug-ins are suitable for use on vocals, kick drums, basses, guitars, or anything else you'd need to mix in a track. Use the Custom Series EQ for its high-pass filtering, low-pass filtering, parametric midrange bands, and bass/treble shelving. Use the Custom Series Lift, that operates in parallel, to boost only your low- and high-end frequencies without clouding up the mix, giving you a subtle EQ lift. Together, these processors provide a musical way of treating your instruments. No one piece of hardware was modeled for this plug-in. Instead, each band emulates the sound, circuit topology, and behavior of a different hardware equalizer. This gives you all the benefits of notable EQs and avoids their drawbacks, all in one plug-in. Boost highs and add lifelike air to a track without incurring the harshness sometimes endemic in passive tube equalizers. Or, tame that infamous brittle bump at 2 kHz in a vocal without sacrificing clarity as you might in certain parametric designs. Both modules operate within the VMR (Virtual Mix Rack) plug-in. When you want to use these equalizers within your DAW, simply instantiate the VMR plug-in, and you'll be able to access them within the GUI. The Slate Digital Custom Series EQ is Mac and Windows compatible. Each EQ can operate in VST, AU, and AAX formats. An iLok 2 or 3 is required to run these processors. Note: Note: This product requires that you have an iLok 2 or an iLok 3. For the bass, the Big and Punchy buttons shape the transient and low frequency information in two distinct ways. Experiment to see which works best on the track at hand. Similarly, the Treble knob gives you Present and Silky modes. This tunes the shape of the high-end. To help you judge your mixing decisions, you can bypass each band of the plug-in individually. You can hear the result of a low-mid boost without taking out any of your shelving or filtering.